FLIR Announces its Most Affordable Thermal Imaging Camera for First Responders | FLIR Systems, Inc.
ARLINGTON, Va.--(BUSINESS WIRE)--Apr. 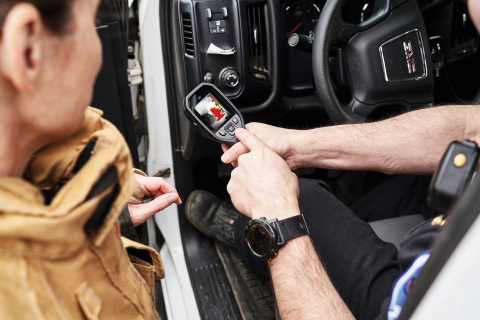 9, 2019-- FLIR Systems, Inc. (NASDAQ: FLIR) announced today the FLIR K1 handheld thermal imaging camera (TIC), FLIR’s most affordable TIC for first responder officers and fire investigators. At $599, the K1 detects heat and provides visibility through smoke and in total darkness to enhance situational awareness for use in wildland fire control, search and rescue missions, structure damage evaluation, and investigative work. The dual sensor K1 is powered by the FLIR Lepton® thermal microcamera, FLIR’s smallest and lowest cost thermal camera core. The K1 uses FLIR’s patented MSX® technology, which extracts high-contrast details from the images taken by an onboard visible light camera and superimposes them onto the thermal images. The K1 simultaneously captures thermal and visible images of a scene and stores up to 10,000 image sets to create post-scene reports, analysis, and evidence. A pistol grip design allows users to view the scene from their line of sight for improved safety and situational awareness. The spot thermometer easily identifies unseen hot and cold spots for instant troubleshooting. The K1 carries an IP67 rating for water resistance and can withstand a 2-meter drop onto concrete. An integrated, rechargeable battery lasts up to five hours on a single charge, and it also includes a 300-lumen flashlight that lends additional visibility of a scene. The FLIR K1 will be available for purchase this summer and demonstration units are now available for testing. The company will show the K1 at the Fire Department Instructors Conference (FDIC) International in Indianapolis, Indiana from April 11 to 13, 2019 at the FLIR booth #3657. To learn more about the FLIR K1, please visit www.FLIR.com/K1.